Have you ever noticed that when you look at room makeovers and images of glamorous bathrooms, there is always a shower niche? Shower niches are practical functions and provide visual interest to a bathroom. I don't know of any interior designers who design a bathroom without them. A shower niche eliminates the need for a shower caddy. The recessed niche provides a space for placing your soap, shampoo, and other bathroom toiletries. It’s easy for a contractor to incorporate into your design because a single niche is built between the wall studs. It also provides visual interest. The recessed feature can be accented with a stunning tile design. It’s an opportunity for a homeowner to showcase tile that is more luxurious but used in a small area it doesn’t break the bank. 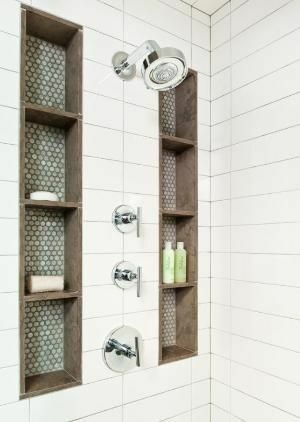 I’ll showcase a variety of inspiring shower niches that show all the possibilities of customization that will make your bathroom your sanctuary. This is only a small sanpshot of how shower niches can be designed. What do you think the most imprtant feature of a bathroom niche is? Continue the conversation in the commnets.